Où l'on découvrira les deux musiciens préférés de Bertolt Brecht et une facette quelque peu surprenante d'Arnold Schoenberg, dont Eisler était d'ailleurs un des élèves les plus doués. On sent que les musiciens s'épatent eux-même de l'évidente qualité de leur travail. Leur joie est communicative. L'Ensemble Stanislas interprète ces pièces avec une technique irréprochable et un grand raffinement artistique. Hanns Eisler : septette N° 1 and N° 2 for strings and wind instruments Kurt Weill : 7 pieces from the Three Groschen Opera for violin and piano Arnold Schoenberg : The Iron Brigade / Christmas Music with Alexis Galpérine, violin and Jeff Cohen, piano. Where one can discover the two favourite musiciens of Bertolt Brecht and a rather surprising facet of Arnold Schoenberg, Eisler having been in fact one of his most gifted students. 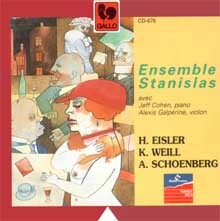 The instrumental technique of the Ensemble Stanislas, the homogeneity of resonance and dynamics are remarkable. It is like the big surprise caused by the Noces of G. Hayrabédian in Aix-en-Provence a few years ago. France is alive and well... One can feel that the musicians are themselves impressed by the obvious quality of their work. They communicate their joy. The Ensemble Stanislas interpret these pieces with an impeccable technique and great artistic refinement.